Lucas Livery stood at the corner of Victoria and George streets in Sarnia and offered horse-drawn transportation in open single and enclosed carriages like these. The driver at left and woman at right are bundled in robes on a winter’s day. Courtesy of the Lambton County Archives, Wyoming. Photographic Collection, 6F. Major events often call for a special ride. A wedding, a high school prom, perhaps a special anniversary celebration – these are all occasions on which people today might hire a limousine. But in the 1890s there were no limos. In fact, there were no automobiles of any kind in Sarnia. The noisy contraptions didn’t arrive for another dozen years or so. Back then the answer was the Lucas Livery Company on Victoria Street. 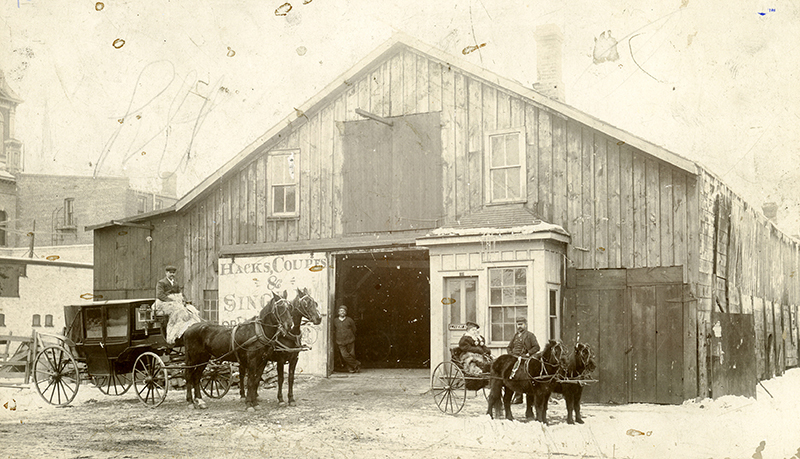 In the Sarnia of the 1890s (population about 6,000) everyone knew the name of proprietor James Lucas, and his company’s large barn-like structure on Victoria Street was a well-known town landmark. In the horse and buggy days Lucas was the industry leader. His company made repairs to carriages and served for some as a storage facility. Young couples looking to hire a buggy or a hack for an evening drive were regular clients. Dignitaries who visited the town were usually chauffeured about in one of “Jim” Lucas’ vehicles, shined, polished and gleaming for the event. Lucas was proud of his stature as the town’s transportation leader, and provided personal attention when his rigs were needed for public events. The Sarnia Fire Department’s first experience with a horse-drawn fire engine featured a team rented from Lucas Livery. Jim Lucas was paid $10 for the use of his horses. Sarnia firemen no longer needed to literally “make a run.” The expression persisted in the department, but no longer meant running on foot to a fire and pulling the fire engine behind. In addition to the livery business, Lucas was also a member of the town’s small fire department. Describing the structure as a “link with the horse and buggy days of years ago,” the story described the deterioration of the building over time and the fire marshal ordering the “landmark on Victoria Street” destroyed. For Sarnians of a certain age in 1942, the razing of the livery stable would have conjured fond memories of a less hectic past – of a time before automobile, when a drive in the country meant clopping along quiet country lanes in a horse-drawn carriage.